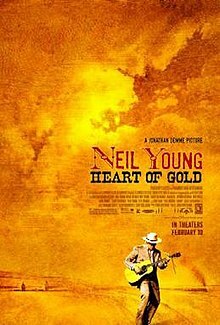 In this exquisite concert film directed by Jonathan Demme, Neil Young expresses modest hopes for his two-night stint at Nashville's famed Ryman Auditorium, the home of the original Grand Ole Opry. He states he wants to "play well, share the stage with my friends, and let the muse have us." He succeeds magnificently, as does Demme, who keeps the music and performers center stage, without intrusive crowd reaction shots, flashy camerawork, or jarring cuts to distract or detract. The flip side of Young's ferocious Rust Never Sleeps, Heart of Gold finds Young in a more thoughtful and reflective mood, performing his Grammy-nominated acoustic album, Prairie Wind.